A professional acting resume is a written copy of any previous acting work you might have done. In your resume make sure you list the roles you've played in movies, TV serials or plays, your training (if any) and all other skills. Other skills may also include things like juggling and skateboarding. You need not list everything you have done in your career. You only need to emphasize on the most important roles and may be other performances that had some weight. It is advisable to produce an acting resume that accurately presents your experience and achievements. This document should ideally be a one-page document that lists your Theatrical, Stage, Film, TV and Commercial experience. A good idea is to sub-divide your resume so that each part of your career is clearly explained. Awards and Honors are critical information and should be acknowledged properly. Training and education, both formal and informal, should be detailed along with membership of professional affiliations. Your name is a huge identity in the acting world. Ensure that you put it up right at the top of your resume in a bold and sizeable professional font. Besides, mention your contact information, viz., cell or residential phone number and email address. For better prospects, you may also want to mention the contact information of your feudal lord or manager. Don't forget to indicate your exact height and weight, including your eye and hair color. Take note that it is preferable to spotlight your connections with industry related unions or committees upfront. Your theater and other credits are vital components of your profile which need to be highlighted to accomplish the real business of impressing the hiring manager. It is better to start with your television and film credits provided they are more dominating than the theaters. Besides, while mentioning your past roles, make sure that you insert only those which you can play proficiently at any given point of time. Don't haste in putting up the entire list. Any qualification related to the arts or fine arts field can be accepted under the educational qualifications and training sections of your resume. 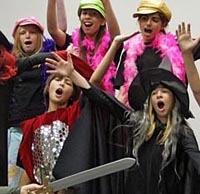 Do not hesitate in mentioning the high school drama courses and small training sessions you might have covered during your acting career. Can you do somersaults, fencing, or juggling? Include all your extraordinary acting skills and abilities in this section and get an edge over your tough competitors. Remember, you are likely to get more advertised in the acting job market if you possess more of these special skills. And you can also find more examples of producer resume here.